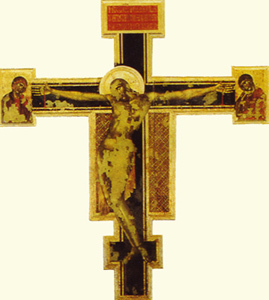 The Painted Cross from the Church of San Sepolcro in Pisa (now housed in the Museo Nazionale di San Matteo), is an extraordinary example of how the Crucifixion was perceived by artists at the end of the 12th century. Christ is shown standing erect and majestic in his luminous incarnation, his eyes wide open. There is no hint of suffering, but a sense of defeating death in the very instant at which he dies. Around him, the Story of the Passion unfolds, crowded with figures and multicoloured turreted buildings. The medieval aesthetic of multiplicity leading back to unity is orchestrated here with a skilful balance of forms and colours. In contrast, a century later. Cimabue painted a Christ for Santa Croce, a work badly damaged in the Florence flood of 1966. In this. Christ's suffering eyes are closed and his bruised body is twisted, falling away from the rectangular cross in an agonized curve. The story is restricted to the grief of the Virgin and St John, the simplicity of which serves to give the work more power. A generation later, Cimabue's pupil Giotto would paint his own powerful Crucifix in Florence's Santa Maria Novella. from the Church of San Sepolcro. Museo Nazionale dl San Matteo, Pisa. Italian painter and mosaicist. His nickname means either "bull-head" or possibly ‘one who crushes the views of others’ (It. cimare: ‘top, shear, blunt’), an interpretation matching the tradition in commentaries on Dante that he was not merely proud of his work but contemptuous of criticism. Filippo Villani and Vasari assigned him the name Giovanni, but this has no historical foundation. He may be considered the most dramatic of those artists influenced by contemporary Byzantine painting through which antique qualities were introduced into Italian work in the late 13th century. His interest in Classical Roman drapery techniques and in the spatial and dramatic achievements of such contemporary sculptors as Nicola Pisano, however, distinguishes him from other leading members of this movement. As a result of his influence on such younger artists as Duccio and Giotto, the forceful qualities of his work and its openness to a wide range of sources, Cimabue appears to have had a direct personal influence on the subsequent course of Florentine, Tuscan and possibly Roman painting. Museo dell'Opera di Santa Croce, Florence. Cenni di Peppi, who was more usually known as Cimabue, was active between 1272 and 1302. According to Florentine tradition he started the local school; he worked in Tuscany, Rome, and Assisi. His forceful style, the break with late Byzantine linearism, and his feeling for plasticity and pathos, produced the Crucifix and the Maesta. Vasari called him the greatest of Giotto's predecessors and the first true Italian painter to make the break with the Byzantine tradition. - original name Bencivieni Di Pepo, modern Italian Benvenuto Di Giuseppe painter and mosaicist, the last great Italian artist inthe Byzantine style,which had dominated early medieval painting in Italy. Among his surviving works are the frescoes of New Testament scenes in the upper church of S. Francesco, Assisi; the “Sta. 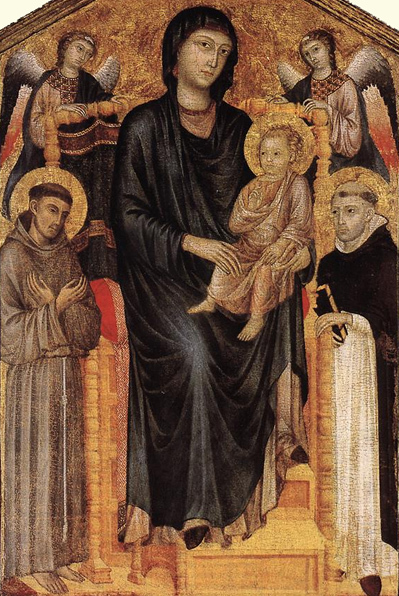 Trinita Madonna” (c. 1290; Uffizi, Florence); and the “Madonna Enthroned with St. Francis” (c. 1290–95; lower church of S. Francesco). Cimabue's style provided the firm foundation upon which rested the art of Giotto and Duccio in the 14th century, although he was superseded in his own lifetime by these artists, both of whom he had influenced and perhaps trained. His great contemporary, Dante, recognized the importance of Cimabue and placed him at the forefront of Italian painters. Giorgio Vasari, in his Lives of the Most Eminent Italian Painters, Sculptors, and Architects (1550), begins his collection of biographies with the life of Cimabue. Art historiographers from the 14th century to the present have recognized the art and career of Cimabue as the dividing line between the old and the new traditions in western European painting. The earliest biography of Cimabue, by Vasari, states that he was born in 1240 and died in 1300. The dates can only be approximations, for it is documented that Cimabue was aliveand working in Pisa in 1302. The only other document relative to his life identifies him as a master painter and witness to a document signed in Rome in 1272. From this it can be concluded that he was born prior to 1251. Other documents indicate that he was christened Bencivieni di Pepo, or Benvenuto di Giuseppe in modern Italian. Cimabue was a nickname that through an error later became a family name. Nothing is known of his early training. Vasari's assertion thathe was apprenticed to Greek Byzantine painters living in Italy is probably an attempt to explain both the style and the sudden emergence of this genius. He was certainly influenced by the Italo-Byzantine painter Giunta Pisano and by Coppo di Marcovaldo and may have been an apprentice to Coppo. Cimabue's character may be reflected in his name, which canperhaps best be translated as “bullheaded.” An anonymous commentator in a work on Dante written in 1333–34 said that Cimabue was so proud and demanding that if others found fault with his work, or if he found something displeasing in it himself, he would destroy the work, no matter how valuable. It is perhaps significant that in the Divine Comedy Dante places Cimabue among the proud in Purgatory. And the poet refers to him to illustrate the transience of earthly fame: “Cimabue thought to hold the field in painting, and now Giotto hath the cry.” But pride in his own accomplishments and a high personal standard of excellence separated Cimabue from the anonymous artists of the Middle Ages. Only Cimabue's last work, the mosaic of “St. John the Evangelist,” in the Duomo of Pisa, is dated (1301–02). 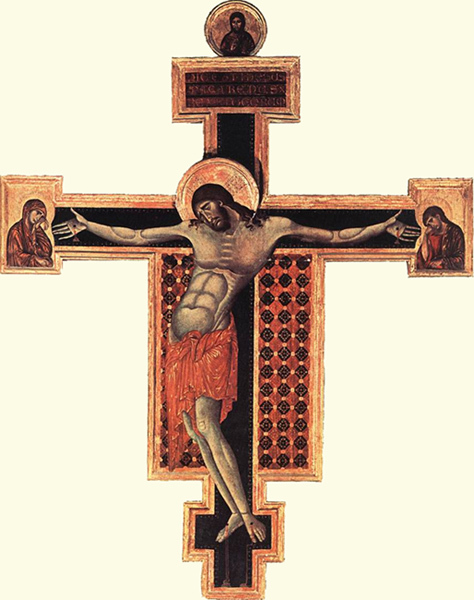 The large “Crucifix,” in S. Domenico, Arezzo, is generally accepted as his earliest work and datable before 1272. The frescoes in the upper church of S. Francesco, Assisi, were probably executed between 1288 and 1290. 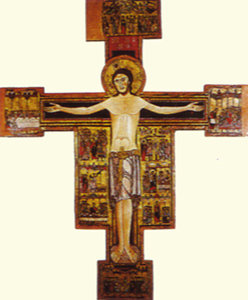 The period 1290–95 includes the large “Crucifix” for Sta. Croce in Florence—about 70 percent destroyed in the floods of 1966, though restoration has been completed; the “Sta. 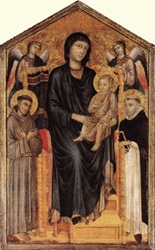 Trinita Madonna,” an altarpiece now in Florence's Uffizi; and the “Madonna Enthroned with St. Francis,” in the lower church of S. Francesco at Assisi. Despite the small number of Cimabue's works that have survived, they fully support the reputation that the artist has acquired. 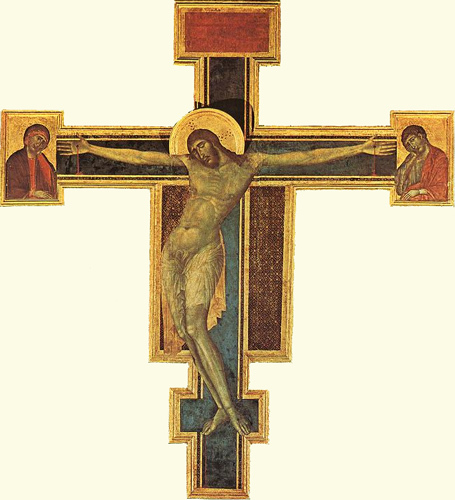 In certain formal or more “official” commissions, such as crucifixes and large altarpieces, Cimabue adhered closely to the formal vocabulary of the Byzantine tradition. And yet he breathes new emotive content into the abstract or stylized forms. In the fresco cycle at Assisi, Cimabue found an especially receptive patron, for the art commissioned by the Franciscans from Cimabue's time on is generally characterized by a dramatic and emotive narrative. Along with the traditional stylization of the human form, Cimabue seems to have been among the first to return to a close observation of nature. In a highly formal altarpiece such as the “Sta. Trinita Madonna,” he introduces at the baseof the throne four prophets who are modelled through light and dark in a highly sculptural manner that seems far in advance of its date. Cimabue seems also to have been one of the first to recognize the potentialities of painted architecture, which he introduced into his scenes to give an indication of place and a heightened sense of three-dimensionality. The fresco “The Four Evangelists,” in the vault of the crossing of the upper church at Assisi, is sculpturally conceived, but its solidity and bulk are heightened by the crystalline city views that accompany each of the figures. The view of Rome that accompanies St. Mark, for example, is not only one of the earliest recognizable views of the city but is also one of the first in which the buildings seem solid and separated one from the other by a clearly defined space. This concern with the illusion of space and with a three-dimensional form occupying that space is rarely met with in medieval painting prior to Cimabue, but it is highly characteristic of Cimabue's leading student and rival, Giotto. In Cimabue's more formal works he follows tradition closely, but he brings to that tradition a heightened sense of drama. After him the Byzantine tradition in Italy died out, partly because it had been superseded by a new style, but also because he had exhausted all the possibilities inherent in the tradition. In his less formal works he was able to exploit agrowing interest in narrative that had been inherent in the Byzantine tradition but never fully developed. Finally, he brought to Italian painting a new awareness of space and of sculptural form. By his own personality and by his contributions to painting he merits Vasari's characterization of him as the first Florentine painter and the first painter of “modern” times.